Front Page » Transportation » South-Dade Transitway gets $100 million, but for bus or rail? 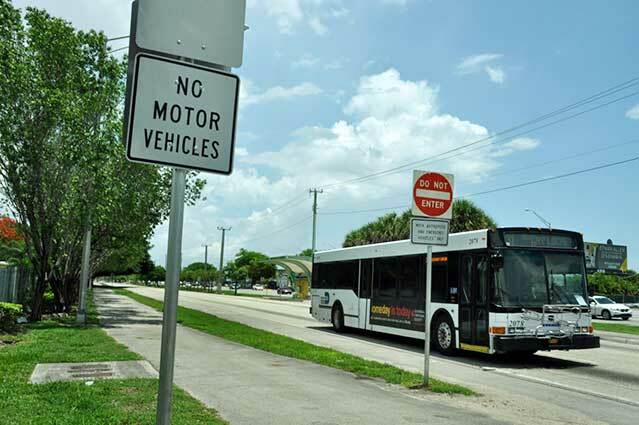 South-Dade Transitway gets $100 million, but for bus or rail? In one of history’s shortest government meetings, the Transportation Planning Council on Monday committed $100 million to build “premium transit infrastructure” on the South Dade Transitway along US 1 from Kendall Drive to Florida City. The council, which advises the Transportation Planning Organization (TPO), in less than a minute OK’d amendments to Miami-Dade’s 2040 transportation plan and 2018-19 Transportation Improvement Program, allowing for the $100 million infusion. The prickly decision whether those funds will be used for infrastructure supporting bus rapid transit or rail at-grade now falls to a TPO Governing Board vote Aug. 30. “[They] will select the locally preferred alternative and, based on their selection, the project cost will be defined,” TPO Executive Director Aileen Bouclé told Miami Today. The $100 million, drawn from a half-penny transportation surtax, is the only funding listed as secured for the work. In 2016, Miami-Dade and the TPO developed the Strategic Miami Area Rapid Transit (SMART) Plan to advance six transit corridors. One is the South Dade Transitway. ■Twelve weather-controlled stations with level boarding platforms. ■Terminal upgrades at Southwest 344th Street and Dadeland South Metrorail station. ■Ticket vending machines, a real-time passenger information system, closed-circuit TV, emergency push buttons, fare collection systems, communications equipment and power supplies. ■Crossing gates and traffic signal preemption at all 45 transitway intersections. If the planning organization chooses heavy or light rail at-grade, costs will rise, Ms. Bouclé said, but most of the infrastructure listed would still be built. “In either case, this item was to place $100 million to start advancing components you’d have to do regardless,” she said. Once in place, those components could be altered to accommodate further development, said Monica Cejas, chief transportation engineer. Metrorail at grade, in recent estimates, would cost $1.3 billion to build and $67 million a year to run. But Dennis Moss and other county commissioners argued rail was promised and should be delivered. One Response to South-Dade Transitway gets $100 million, but for bus or rail? What about the North Corridor which was also promised heavy rail?